Mesy Comics is the self-publishing comic book company of Matt Strott. In reality it’s not so much a company as it is one guy with a vivid imagination and very little sense. Ironic since it all began with a single comic poking fun at another guy with equally big aspirations….little did Matt realize how that first comic would come to be a metaphor for his entire career. It all started back in 1988 with Matt Strott, a boring social studies class, a number 2 pencil and a British ski jumper named Eddie “The Eagle” Edwards. An inspiration in both heart and determination, Eddie was also the spark to ignite Matt Strott’s passion for absurdist comedy. For those of you never lucky enough to watch The Eagle, you missed something special. Eddie flew through the air with all the grace, style and aerodynamics of a newborn moose. Time and time again, his quest to fly ended in a spectacular crash, always falling far short of the competition. (Out of the 57 Olympic competitors that year, he finished 56. The 57th was disqualified). But no matter how many times he crashed, he always got back up and jumped again. If the crashes were spectacular, the triumphs were amazing! You wouldn’t know to look at him, how ridiculously short he was of the competition. He was always beaming with pride. Some might say Eddie was foolish to devote his life to a sport he had very little chance to reach the pinnacle of, but a true fool would not have had the courage to jump in the first place. It is that same foolish pride and reckless abandon upon which Mesy Comics was founded. 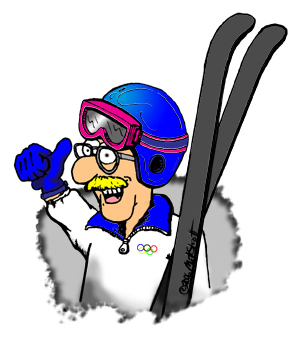 That same spirit of absurdity which compelled a goofy British guy to take up ski jumping (without a mountain or snow), is the same spirit of absurdity which compelled Matt Strott to take up cartooning, without plan. As in life, the spectacular crashes and the miraculous landings are unimportant. It’s the jump that counts! Mesy Comics is one cartoonist’s jump toward a dream – the dream of making comics. After high school, came college and a growing love for cartoons. Matt quit engineering in his freshman year to take up art as a career. The plan being to make comics for a living and if all else failed, do them as a hobby. Training for a career in the graphic arts was invaluable in shaping Matt’s life, but finding work as a cartoonist was frustrating. Even getting published in the college paper seemed near impossible at times. But from the college years in the mid 1990’s, came the character Moon Cheese and the 1st attempt at getting his own syndicated strip. Although the strip showed promise, it was ultimately met with rejection. Matt gave up the strip and went to work as a graphic designer full time. From 1996 to 2005 Matt primarily worked as a graphic artist but the desire to become a cartoonist still burned bright. He continued to practice his craft and think of new ideas for a syndicated strip. It was during this time that he began to experiment with the single panel cartoon and it is still the format he prefers to work in today. In 2005, he packaged 48 panels under the title of “The Last Resort”. Chosen because it truly was Matt’s last resort for achieving syndication but also, for the metaphor. “The Last Resort” is the imaginary place where rational thought takes a vacation. The humor is primarily absurdist comedy with an irreverent edge. Matt takes his inspiration from life observances: popular culture, fairy tales, mythology, religion, history, literature and language. He attempts to cleverly mangle them in such a way that the end result is absurdly funny or, in the very least, clever. Although there are some characters that periodically make appearances, “The Last Resort” is a comic of ideas and not one of character development. The comic may not have made it to syndication but it has survived to this day as the place where Matt prefers to vacation. New comics are still being made and will continue to be posted to this site and the blog, but for the most part Matt has given up his dreams of syndication. He is happy being a graphic designer and making comics when he feels inspired. The Future of Comics is Going to be Mesy! Upon realizing a syndicated comic strip wasn’t in his future, Matt attempted to launch his strip on his own website in 2005. Lack of web knowledge made it an utter disaster. In January of 2012, Matt’s wife encouraged him to create a blog to showcase his work, since he had so many comics just gathering dust. By putting them on-line, at least some people might enjoy them. So, “The Last Resort” was resurrected as a blog format. It was such a positive experience that Matt has decided to expand his dreams of bringing Mesy Comics to the internet. August 2012 saw the relaunch of MesyComics.com. This will be the home of Mesy Comics for the foreseeable future. It will be the primary site for showcasing the comics, cartoons, illustrations and graphic design of Matt Strott. Some day, Mesy Comics may also include animation, television, theme parks and (if all goes well) a complete line of vending machine products…but for now, it’s just a gallery for Matt’s art. Like most art, it’s a work in progress. Please check back soon for more updates and continue to enjoy the “The Last Resort” . It will be the primary launch site for new work and commentary from Matt. Thanks for visiting!